The new governor of Michigan ran on a memorable campaign slogan, “Fix the d*** roads!” We are happy to help with that mission by supplying parts to companies that manufacture road-building equipment (we all drive on these awful roads, so there’s a vested interest as consumers and producers). We all know that a whole lot of roads in and all around Metro Detroit need serious work! It’s not only here in Michigan of course, but we also get orders from all over the midwest. 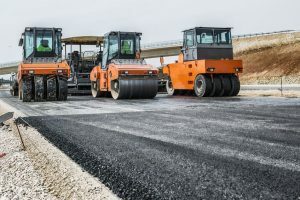 When you’re creeping along and zipper-merging into a construction zone, do you look at the amazing variety of vehicles and machines that repair and build the roads and bridges? If you worked at Detroit Tube Products, you probably would! We make parts for cranes and excavators, concrete-cutters, earthmovers, as well as asphalt tankers and trucks. Our customers build the heavy-duty diesel engines and the air compressors that power these machines. Our tubular parts and assemblies go into exhaust connections, manifolds, as well as the water and air intakes. We help keep asphalt hot and engines cool so the road-building process goes smoothly. As a premier tube bending company in Michigan, we make parts for mobile generators too. These turn construction lights on at night and in winter darkness to get the jobs done faster. Detroit Tube Products is happy to bend small quantities at a time of specialized parts so our customers can make customized equipment. We bend large diameter tubing on tight radii for all kinds of low-pressure applications, including road-building equipment. In addition, making and carrying custom bending dies for unique applications is our specialty. Next time you’re stuck in an orange barrel crawl, take a look for tubes on the machines at work — it’s pretty sure you’ll see something that Detroit Tube Products has crafted.